What do you spend your cash on when you're milking the hell out of the internet with your very own filesharing supersite? Buy things like a Rolls-Royce Phantom with a license plate reading "GOD." Now, the government owns it! 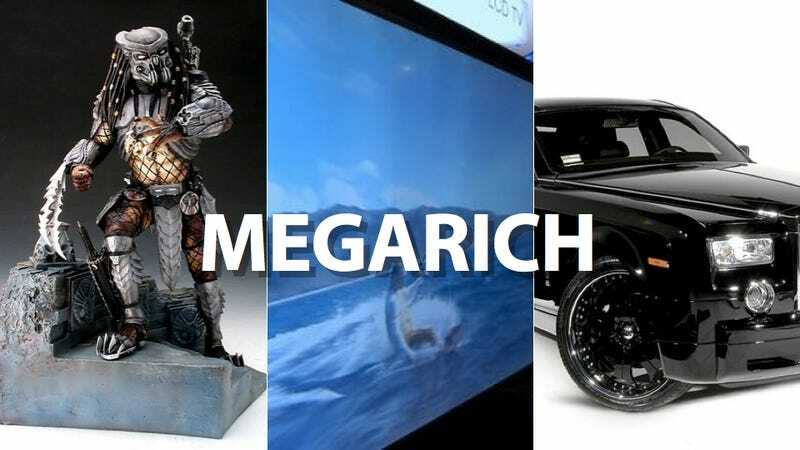 Revealed in the enormous 72-page indictment against Megaupload's operators is the huge list of forfeited property—and it's way more than just their data servers (of which there were sixty). Some highlights? 2010 Mercedes-Benz ML63 AMG, VIN WDC1641772A608055, LicensePlate No. "GUILTY";75. 2007 Mercedes-Benz CL65 AMG, VIN WDD2163792A025130, LicensePlate No. "KIMCOM";76. 2009 Mercedes-Benz ML63 AMG, VIN WDC1641772A542449, LicensePlate No. "MAFIA";77. 2010 Toyota Vellfire, VIN 7AT0H65MX11041670, License Plate Nos. "WOW" or "7";78. 2011 Mercedes-Benz G55 AMG, VIN WDB4632702X193395, LicensePlate Nos. "POLICE" or "GDS672";79. 2011 Toyota Hilux, VIN MR0FZ29G001599926, License PlateNo. "FSN455";80. Harley Davidson Motorcycle, VIN 1HD1HPH3XBC803936, LicensePlate No. "36YED";81. 2010 Mercedes-Benz CL63 AMG, VIN WDD2163742A026653, LicensePlate No. "HACKER";82. 2005 Mercedes-Benz A170, VIN WDD1690322J184595, License PlateNo. "FUR252";83. 1989 Lamborghini LM002, VIN ZA9LU45AXKLA12158, License PlateNo. "FRP358";92. A lot of cars for seven guys. How about some dubious art? Duplicates! If only they'd made it free long enough to see an OLED for sale. Update The elusive Rolls-Royce Phantom has been found! Eagle-eyed tipster Ming C. points to a CarJam (the New Zealand version of Carfax) listing for one black, drop-top Phantom with license plate GOD. What, the Feds are already getting it prepared to sell? MegaUpload's corpse isn't even cold yet.